Providing shelter after a disaster is recognised as one of the most complex areas of humanitarian relief and recovery. Some aid agencies have stopped providing shelter altogether after bad experiences, while those that do quickly become engaged in challenges that go far beyond the provision of structures alone. Yet with the number and severity of disasters set to increase, due to climate change and rapid urban growth, the need for approaches that work has never been greater. This book explores the issues in three parts. The first, Practice, looks at lessons from past efforts. Part two, Process, proposes practical and effective people-centred approaches. Part three considers currently neglected issues such as disability, human rights and urban-oriented approaches. 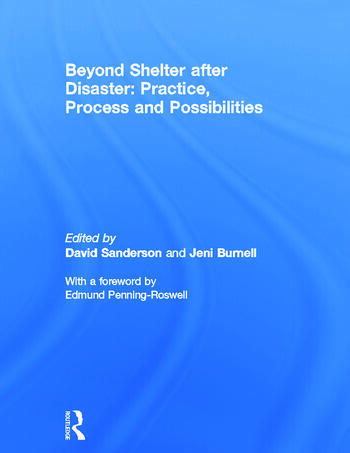 Through practical case studies and academic research, Beyond Shelter after Disaster critiques past methods and explores future options for improving practice in one of the most complex areas of post disaster relief and recovery. This book was originally published as a special issue in Environmental Hazards: Human and Policy Dimensions. David Sanderson has over 20 years’ experience in humanitarian aid, mostly with NGOs. He is currently a Professor and Director of the Centre for Development and Emergency Practice (CENDEP) at Oxford Brookes University. Jeni Burnell trained as an architect before pursuing a career in community art, architecture and development. She has a Master’s degree in development and emergency practice and is currently a Research Associate at CENDEP, Oxford Brookes University. Her specialisations include shelter after disaster and community-led development using the ‘Small Change’ approach.